Are you a home chef? Do you look forward to the time you spend in the kitchen, whipping up your newest concoction? Whether you’re a veteran or a novice, whether you’re the next at-home Rachel Ray or you cant tell a teaspoon from a tablespoon, everyone can use some handy tricks to make cooking easier. Have you ever wondered why a recipe that says it takes an hour to make online ends up taking you an hour and a half in your own kitchen? Oftentimes its because the person who wrote that recipe knew some handy tips and tricks that you didn’t. If you are ready to take your cooking skills to the next level, read on. 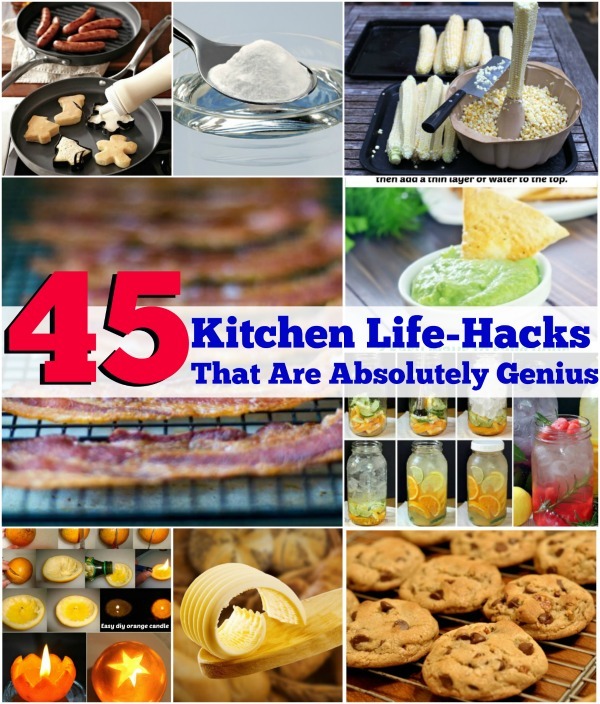 We will teach you 45 amazingly simple and genius kitchen hacks that will transform the way you cook forever! Bake bacon in the oven. 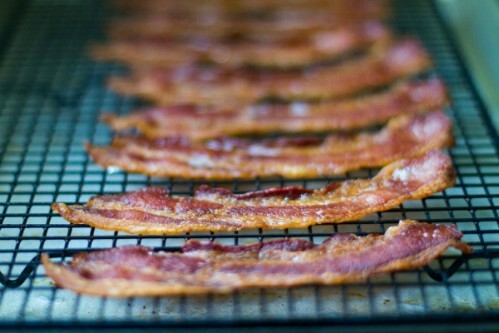 Ever wonder why the bacon you get at a restaurant is always evenly and consistently cooked with no annoying raw ends? Ever wonder why the middles don’t get all crumbly or hard and overcooked? The difference is all in the cooking. Whereas most home chefs fry up bacon on the frying pan, most restaurant workers bake it in the oven. Try it out at 400 to 420 degrees Fahrenheit and be amazed! Slice a lot of cherry tomatoes simultaneously. Cherry tomatoes add a delicious splash of flavor and color to any dish but slicing them in half is really difficult if you have to do it one at a time. But you don’t! Not with this handy little kitchen hack. Have two plastic lids that are the same size? Good. Put a bunch of cherry tomatoes on one of the lids (have it so the inner part of the lid is facing up). Now, put the other lid on top to sandwich them inside. Hold the lid down, grab a knife, and cut through all of them at once. 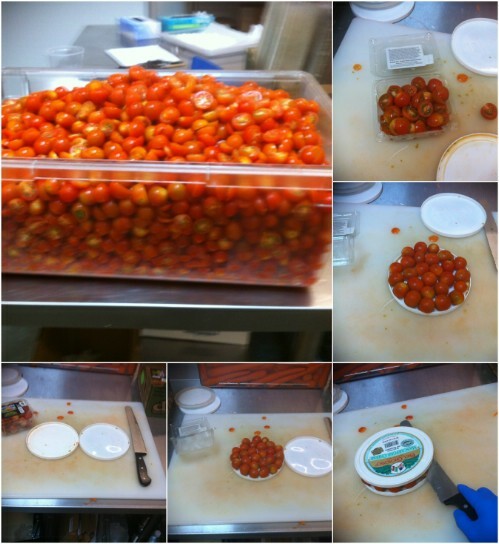 Pull off the lid, and all your cherry tomatoes will be sliced neatly and cleanly. Want to knock someones socks off at a dinner party or a date? This kitchen hack is for place settings, not for food preparation, but it still involves food. Instead of grabbing a candle and putting it on the dinner table, why not grab an orange instead? 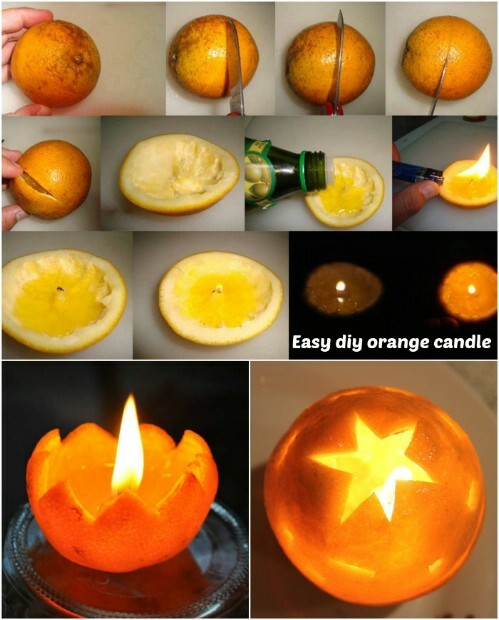 Yes, oranges can be made into candles, and quite simply too. Start by slicing your orange in half. Do not slice through the part where the stem was that part will become your wick inside the orange, so you want to slice perpendicularly to that part. Next, remove the flesh from inside the orange, but be careful not to remove the part that sticks out inside where the stem used to connect. This becomes the orange wick. Now, pour a little oil into the orange half. Olive oil works great. Then use a lighter and light the wick. You will have an orange half acting as a candle, burning the oil. You can get fancy with this by cutting the orange half with patterns edges. Or you can take the other half and remove the flesh from it as well, and then use it to cover the bottom half. Cut a hole on top so that the flame is uncovered. Make the whole fancy if you want. The orange candle looks beautiful, luminous and clever, and will impress anybody who eats with you. Drizzling pancake batter into whimsical patterns using an icing dispenser isn’t the only pancake hack in our kitchen cabinet. Another easy one is cookie cutters, the same ones you use to make sugar cookies over the holidays. Simply place them on your frying pan, pour the batter inside the outlines, and watch as your pancakes rise in amazing shapes. Of course, they will largely be shaped like Christmas trees, snowmen, and gingerbread men, but this makes them the perfect holiday breakfast treat! Oh yeah, and before we forget, you can totally do this with eggs too when you’re cooking sunny-side up. Just pour them into the cookie cutters and watch as they shape perfectly (and whats arguably even better, cook evenly). Guacamole is delicious, but it can be a bit tricky to preserve. It goes brown and also changes flavor when it is exposed to oxygen. 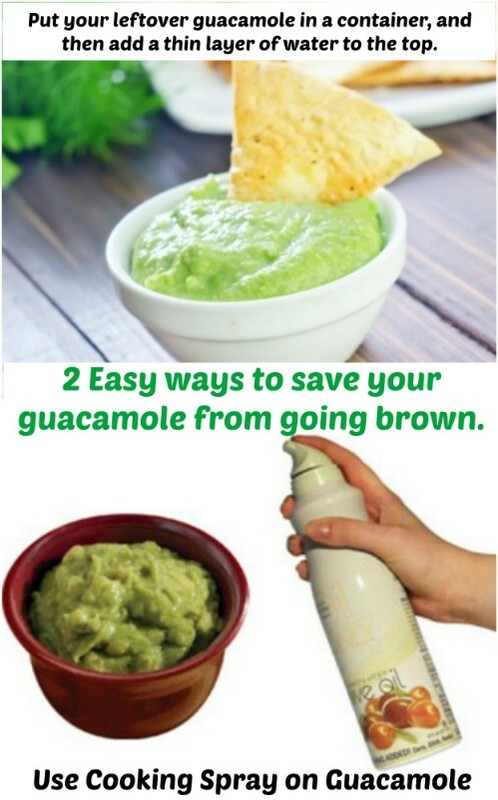 If you want to prevent this, you can put your leftover guacamole in a container, and then add a thin layer of water to the top. The water acts as a protective barrier, and prevents the guacamole from reacting with the oxygen in the air. Pour the water out of the container when you are ready to eat it. The guacamole will stay green and delicious. While were at it, microwaving guacamole ruins it really fast. Whenever you have leftover Mexican food, try and store the guacamole separately so that you wont have any of it heating up and getting ruined in the microwave. If it is already with the rest of your food, scoop as much of it out as you can, heat up your food, and then put the guacamole back on top of it after you take it out of the microwave. This will keep it fresh, green and delicious. You’re getting ready for a dinner party, and you’re finally getting everything out on the table. You realize then you forgot to pull the butter out of the fridge. You take it out, and of course its hard as a rock. But dinner is in two minutes! What do you do? Nobody likes cold butter that is impossible to cut. It turns out there is a perfect solution which allows you to soften your butter without melting it, and it only takes a couple of minutes. This is an easy way to make your dinner guests happy. Just get a small glass and warm it up, then put it over top of the butter. You can heat up the glass by running warm water over it or by putting it in the microwave for a few seconds. 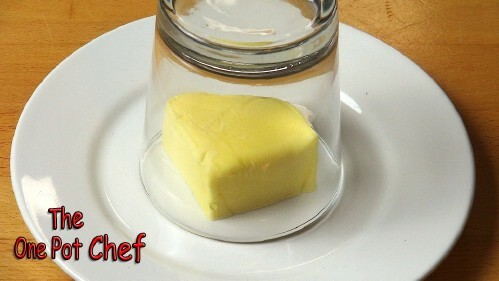 The butter under the glass will quickly soften and will be just the right consistency to easily cut and spread. Voila! Peel an orange with ease. Laziness is no longer an excuse for not eating your fruit! Oranges are delicious, but lets face it, peeling them is a pain. But does it have to be? 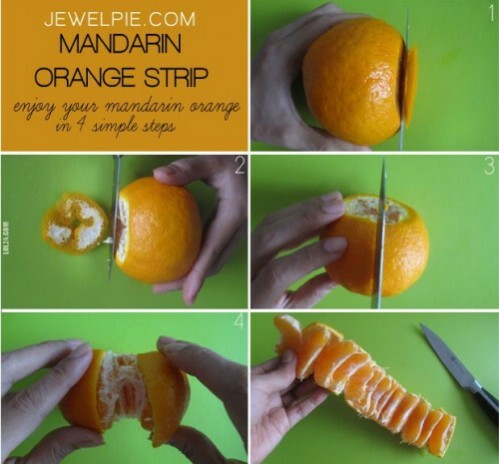 Not if you use this orange-peeling hack from Jewelpie.com. Put your orange down on a cutting board. Use a knife to slice off a thin bit from the end, and then do the same thing with the end opposite. Next, cut a perpendicular line. You want to go almost clean through the orange, but not all the way. Then you can pull both ends away from each other and stretch out the orange in a long strip. Then you can just grab each slice off the strip and enjoy! Get those pesky eggshells out of your bowl. This is practically a daily experience for anyone who does a look of cooking, especially baking. You crack your eggs into the bowl, cringing the whole time, because you just know they aren’t going to break evenly. Sure enough, a little piece of egg shell falls into the bowl and gets stuck in the egg white. You poke around for a full minute trying to get the pesky thing out of there. There is an easier way! And it is incredibly simple. All you have to do is make your fingers wet, and try again. You will be amazed how well this works. 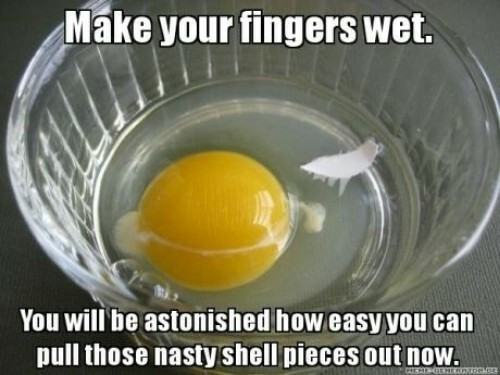 The little egg shell bit should adhere right to your fingers and come out. While were at it, do you hate when bits of egg white run down the side of your bowl and drip all over the counter? Try putting the bowl at the edge of the counter and a trash can under it. Any whites that drip down will go into the trash bin and you will not have to clean it up. Get corn off the cob easily and neatly. Corn on the cob is delicious, but its not fun for everybody to eat. If you have braces, jaw issues, or you just don’t enjoy getting all those corn-bits between your teeth, you might prefer to cut your corn off the cob. Of course, this is royal pain. In fact, odds are at some point in your life, you have avoided corn on the cob because you cant be bothered to cut it off, scrape it off your cutting board and into your bowl, and then pick up all the corn you missed that fell onto the counter, the sink or the floor. Enter the Bundt cake pan! This is an easy way to catch all the corn you are cutting off the cob. Just put the cob in the center, standing it up on the protrusion, and cut downwards. The corn will all fall down into the pan. No corn on the counter, sink or floor. And you can just spoon it right out of the cake pan and into your bowl. 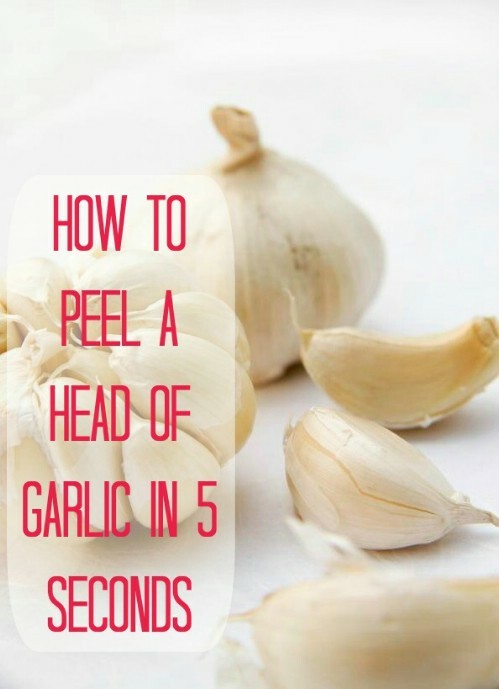 Peel a head of garlic in seconds. It turns out there is a hack for peeling garlic that is every bit as simple as the hack for shucking corn. All you need is two bowls that are the same size. Put your head of garlic in one of the bowls, and then put the other bowl on top of it to create a closed container. Then simply shake the bowls really hard. In a minute or less, you can open the container back up and look inside. Assuming you shook it hard enough and long enough, you should see all the skins separated from the garlic cloves. Awesome! 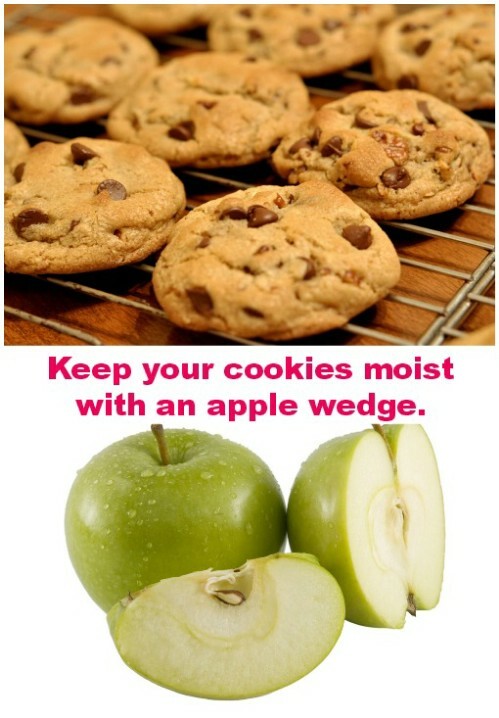 Keep your cookies moist with an apple wedge. Nothings tastier than deliciously moist cookies right out of the oven. And nothings more distressing than those same cookies not being half as moist or delicious a few days later. If you bake cookies in large batches, you don’t want to have to eat through them all in a few days, though. You want to make them last. Instead of putting them in the cookie jar, try storing them in Tupperware along with an apple wedge. The cookies will draw in moisture from the apple wedge and will keep a lot longer this way. If you are storing them for a while, you can always replace the apple wedge with a new one. This one is apparently an army trick. In Israel they have a lot of canned tuna rations, and if you get bored enough with your tuna rations you start to think. Lets see, Ive got this canned tuna, some toilet paper, and a lighter. What can I do with that? Turns out what you can do is cook the tuna in its own oil in the can. All you have to do is cut a piece of toilet paper to size (you want about three sheets per can), open the can, and stuff it in on top. Leave a little pocket for the air to escape so it doesn’t blow up in your face. Make sure that the entire toilet paper sheet is wet with oil, and then light each corner of the toilet paper. You don’t have to wait for the flame to go out on its own if you do, you will wait around 25 minutes. You will need to experiment and decide just how well done you want your fish. Blow it out whenever you are ready. 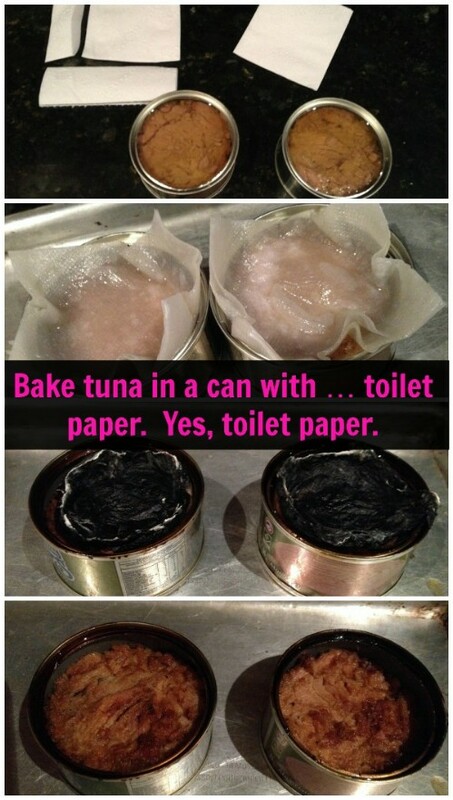 The toilet paper is surprisingly easy to remove, and the result is delicious smoked tuna. You can use a napkin as well, but for whatever reason, toilet paper seems to work a lot better. You may feel embarrassed about cooking with toilet paper, but just think how awesome you will feel about cooking with an open flame! Brown sugar likes to compact, and when it does, it can become as hard as a brick. When you are baking, you don’t want to waste time making your brown sugar soft again (but we have a hack for that too, which well share with you in just a moment). 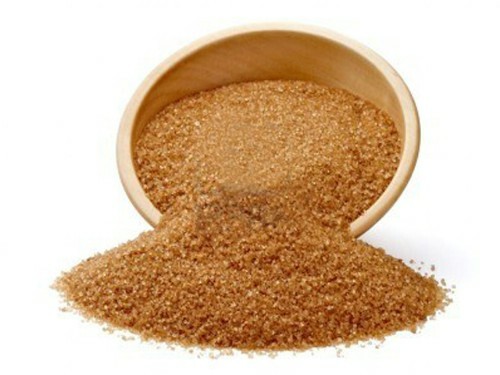 You can prevent your brown sugar from going hard by simply storing it with a piece of bread. We dont want to get all science-y, so suffice to say, it works. Whats really cool is that you never have to change out the piece of bread either, because sugar prevents mold from forming. Alternatively, you can also use a marshmallow. And what if your brown sugar is already as hard as a brick? It turns out this is also easy to deal with. Just put it in a baking dish, cover it with a wet paper towel, and throw it in the microwave for twenty seconds. Ta-da! Soft sugar. Don’t have a microwave? You can do it in the oven; it takes five minutes. Just use the bread trick though and this wont happen anymore. 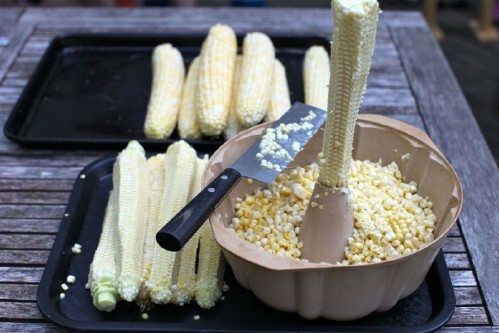 Shuck corn the easy way. Corn … golden, sweet, life-giving, buttery and delicious. Corn goes great as a side dish with pretty much anything. Did you know there is an incredibly simple way to shuck corn? It literally takes just two steps. Even people who grow corn often don’t know this little trick. All you have to do is put the ear of corn down on a cutting board. Chop off the end (the end with the stem, not the other end). Stand the corn upright on the flat end you have chopped. Grab it by the top and unsheathe it from the leaves by gently tugging on them. The corn ear will literally fall right out. Get touch lids off jars with a bottle opener. 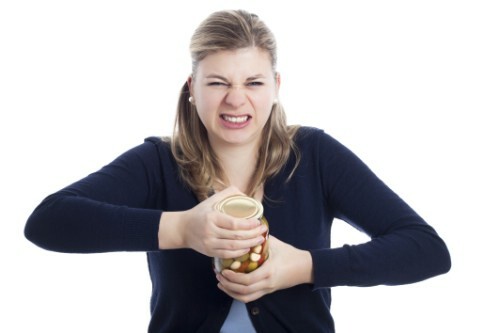 Tired of wasting time in the kitchen trying to get impossible lids off of jars? If you don’t have one of those nifty rubber things handy, but you have a bottle opener, you can get the lid off. Lift with the bottle opener at the edge of the jar lid until you hear a pop. Then you can easily unscrew the lid. Alternatively you can use any sharp thing to get the lid pop. Replace ice cubes with frozen fruit in drinks. Serving up some drinks with your meal? Instead of adding ice, think about adding frozen strawberries or grapes or other fruit pieces. They will subtly change the flavor of the drink, so it may take some experimenting to figure out what you like. A lot of people enjoy frozen grapes in white wine for example. Why is this an awesome idea? 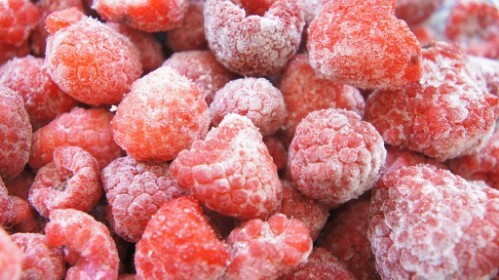 Frozen fruit cools down your drink without watering it down, and at the end, you can eat the fruit. Use dental floss to cut cakes and more. Earlier we talked about using a warm knife to cut cake perfectly. Another easy alternative is a piece of dental floss. Get the unscented type so you wont mess up the flavor. The floss will make a nice clean cut, and can be used for cakes, pastries, and more. You can use it for soft cheeses too. Replace vegetable oil with butter to make your recipes richer. Cook up the perfect sunny-side up egg. 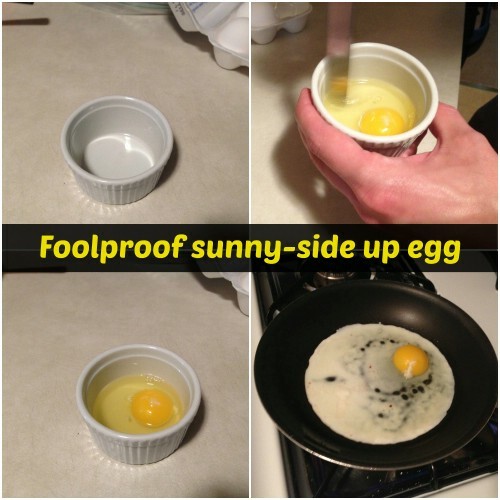 If you have problems getting your sunny-side up eggs to come out sunny-side perfect, you’re not alone! A lot of home chefs struggle to get their eggs to spread out nicely, cook evenly and thoroughly, and not burn in the process. Grab a bouillon bowl or something similar, break your egg in it, and take a moment to whisk the whites. Be careful not to break the yolk! This one simple step will help your egg to spread out perfectly in the frying pan and cook evenly! You can grease your frying pan with vegetable oil, but this is yet another recipe where butter can contribute to a better-cooked egg with a richer flavor. You can also try bacon grease, which goes great in lots of other recipes as well. Prefer your eggs scrambled? A quick tip for perfect scrambled eggs stir in a little milk before you scramble them. They will come out fluffy, rich, and delicious! Get flatter, evenly baked cakes. When your cake comes out of the oven, does it look raised or indented? This might not be a big deal if you are planning on just chowing down and enjoying it, but if presentation is one of the main reasons you’re making the cake, you want it to be perfect! This is especially helpful if you’re going to be decorating it. 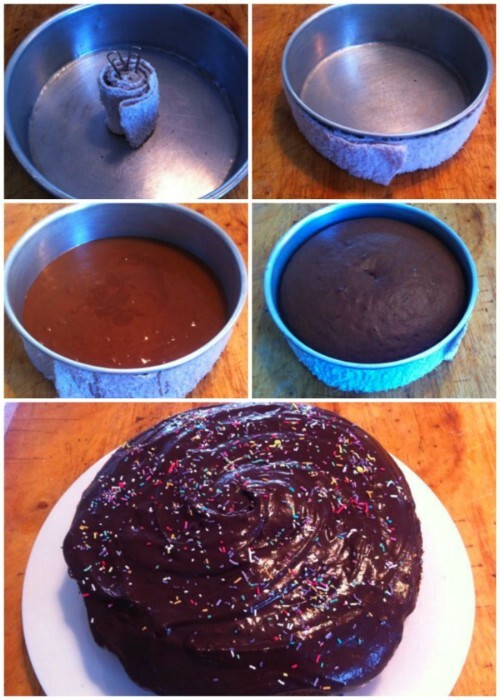 Heres a super easy way to make sure you get a perfect flat cake! Have an old towel you don’t need? Cut a strip that measures the same height as your cake tin. Get it damp, and wrap it around your cake tin. Put the cake tin in the oven, cook as usual, and hooray! you will get the perfect cake! If you do a lot of camping, then you probably already know this one. If not, you’re about to learn a really easy way to cook without pots and pans. A tin foil dinner is literally a dinner you make in a tin foil. There are hundreds of recipes out there. 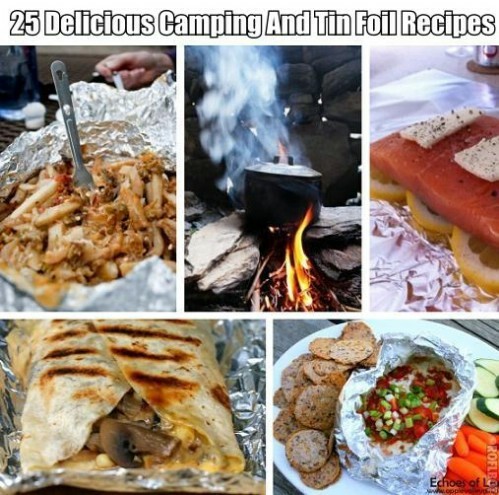 You throw the ingredients into a sheet of aluminum foil, ball it up, and hold it over a campfire (or your fireplace). Once its done (how long it takes depends on what you make), you pull it out of the fire, open it carefully, and dig in. Easy, fun, delicious, and no cleanup afterwards! Make a perfect egg burger. If you enjoy a burger with an egg on top, the only thing better is a burger with an egg inside. It keeps everything neat and takes time and hassle out of your cooking. How do you do it? Get your burger patty ready, and then set a glass on top of it, face-down. Use the glass to stamp a hole out of the middle of the patty. Put that meat aside. Now, put the burger patty with the hole in it in your frying pan. 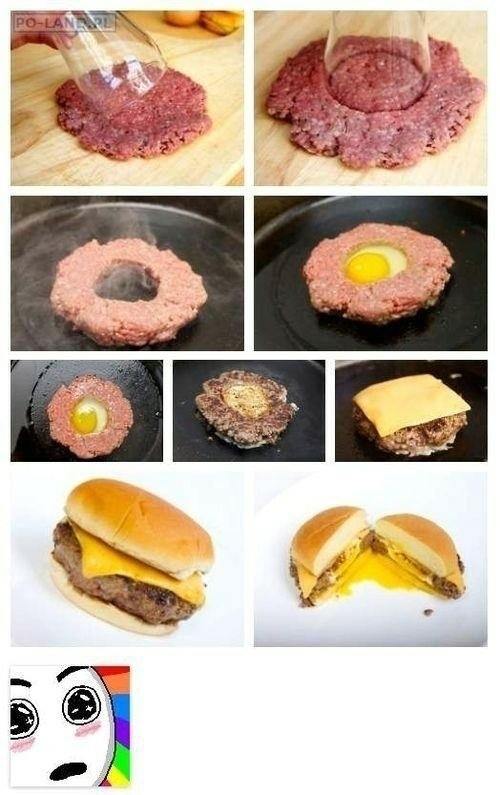 Start cooking the burger, and then pour an egg into the middle. Watch in wonder as both the burger and egg cook simultaneously, with the egg perfectly contained in the center. 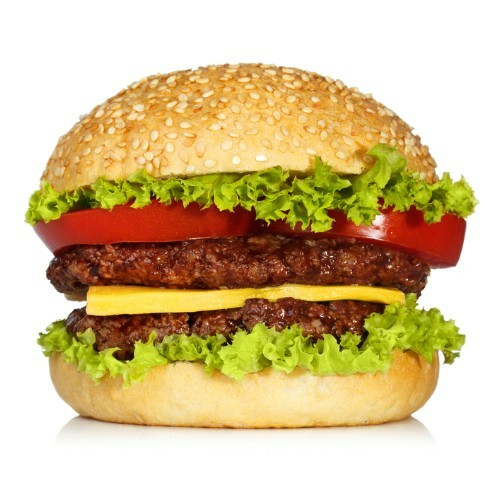 You can use the leftover bits of meat from the centers of your patties to make another burger. Scoop your egg-burger off the frying pan, top it with whatever you want, and serve. Squeeze lemon juice with tongs. When you are trying to make lemonade, what do you do if you don’t have a lemon juicer? Or what if you just don’t feel like cleaning the extra dishes? 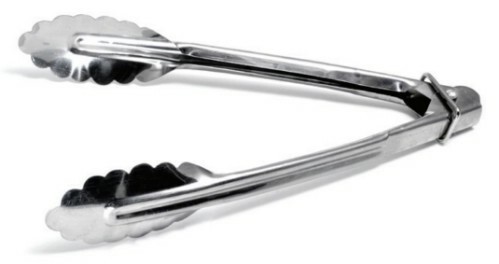 Heres one easy alternative: use tongs! With a pair of tongs, you can easily squeeze all the juice out of your lemons, straight into the pitcher. It doesn’t get simpler or faster than that, and theres less cleanup involved. Wolfram Alpha is really useful for cooking. … and Wolfram Alpha will give you a nice little nutritional label just like you would find at the store, complete with calories, fats, cholesterol, protein, vitamins, and everything else. It will also give you handy little options you can quickly and easily adjust, like whether something is cooked or not or cooked a certain way. There are also other apps like MyFitnessPal or Lose It! which provide similar information. Turn any cake mix into cookie dough. 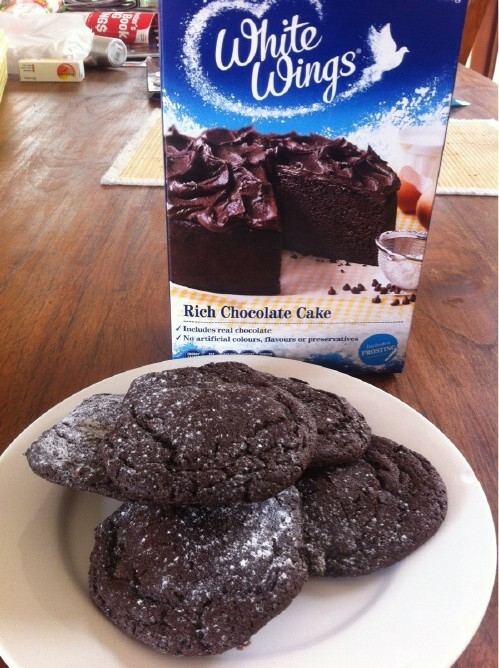 Love a particular cake mix but wish you could enjoy cookies that taste about the same? Its actually incredibly easy to turn cake mix into cookie dough; it is just a difference in consistency. Most of the ingredients that go into cake mix and cookie dough are about the same. It turns out all you have to do is add 2 eggs and half a cup of oil. Instant cookie dough! Cook an egg in a mug. You get up in the morning for work and look at the clock and realize you’ve woken up fifteen minutes late. You only have a few minutes to get out the door and on the bus. But you really, really feel like an egg! You don’t have time to stand over the stovetop cooking though, and you really don’t have time to deal with the dishes afterwards. What do you do? Put the egg in a mug. Well be honest this doesn’t make the most amazingly delicious eggs in the world (microwaves can be finicky and it can be tough to get the timing exactly right), but in a pinch its still pretty satisfying. You can make scrambled eggs, poached eggs, and even omelettes in a mug! For a scrambled egg, coat the inside of an 8 ounce mug with cooking spray. Crack two eggs inside, add in salt and pepper to taste, and stir it up with a fork. Put it in the microwave for 45 seconds, flip over the contents, and microwave for another 45 seconds. Take it out and it’ll be done. Want to poach an egg in the microwave? Pour half a cup of water into your mug and crack a single egg. Push it under the water and cover the mug with a saucer. Microwave for about a minute on high. Your egg should be done. You can make omelettes much the same way you make a basic scrambled egg in a cup. Just add whatever you want and microwave for about 75 seconds. How awesome is that? Instant eggs with no mess, no dishes, and no time wasted! Perfect for those rushed mornings when you need some protein to get you on your way. Also great for the office or the dorm room when you don’t have a stove handy at all. Make your bad wines taste good. 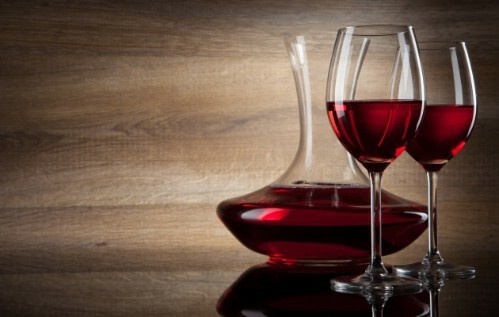 Ever end up with a bottle of wine that is just meh, but you don’t want to waste it? There are a number of options for improving the taste (assuming you don’t just use it to cook, which is a perfectly good option!). You can try chilling the bottle, or you can mix it with fruits and herbs to get sangria (people have been using that trick for centuries). If its a red wine, you can try eating mushrooms. For scientifically inexplicable reasons, this seems to improve the flavor. Spicy food is also great for suppressing unpleasant flavors in wines. One more amazing trick that works for wines with a sulfury odor or taste is to drop a penny inside. Those smells and tastes really are coming from sulfur compounds, and the copper from the penny can neutralize them. This makes the bad taste and smell go away. Isn’t chemistry cool? Mellow out your garlic and onions. 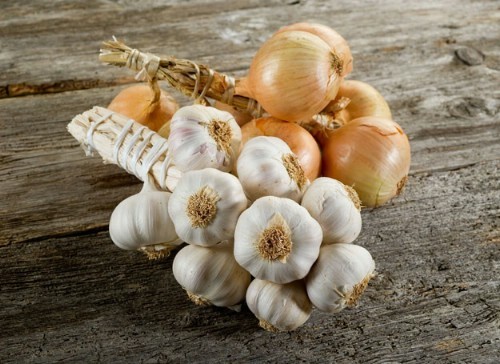 The sharp bite of garlic and onions is one thing that makes them delicious, and allows them to take so many bland recipes and give them a little something extra. There is such a thing as too much of a kick, though, and if your onions and garlic are too sharp, all they will do is burn your esophagus all the way down. If your alliums are a little too sharp for your taste, all hope is not lost! To mellow garlic, either boil it in milk or water for about 5 minutes, or throw it in the microwave for about 2 minutes. Mellowing onions is a similar process. Just let them soak in water for about 10 minutes. Wish your onions were sweeter? Try sprinkling them with salt. This will also soften them up. Dipping them in vinegar is another option. Now you don’t have to put up with sharp alliums and lament that you didn’t get sweet onions. You can make your onions and garlic taste exactly the way you want them to! Pit cherries the easy way. Cherries are delicious, but who enjoys spitting out pits? 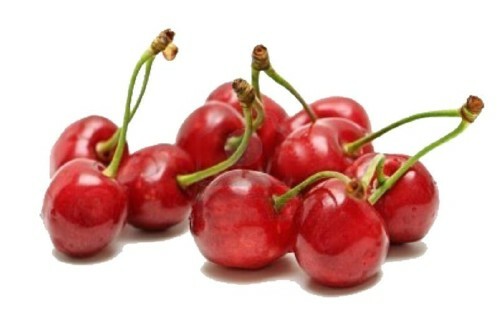 Cherry pits are a pain, and if you try to extract them before you eat the cherry, what you usually end up with is a mess of cherry juice running down your hands. Cherry juice tends to stain something fierce too, so thats bad news if you are wearing light-colored clothing. Heres a genius way to save yourself a lot of hassle! Get a soda bottle or a beer bottle, and set a cherry on top of it (with the bottle open). Grab a chopstick, and simply poke down through the top of the cherry and into the bottle. The chopstick will push the pit right out through the bottom of the cherry, and it will pop into the bottle! You can pit a ton of cherries this way really fast, and the bottle conveniently catches all the pits so you can dispose of them all at once with no mess. Hard boiled eggs are delicious, but how often do you find yourself avoiding making them simply because it is such a royal hassle to get the shells off? 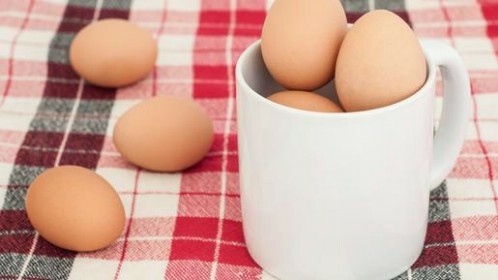 It turns out there are a number of easy ways to get eggshells off without all that trouble. Here are a few awesome egg-shelling techniques! Roll the egg on the counter. Simply crack the shell, roll it around on the counter so that it forms lots of small cracks, submerge it in cold water, and pull off the shell. Use a spoon. 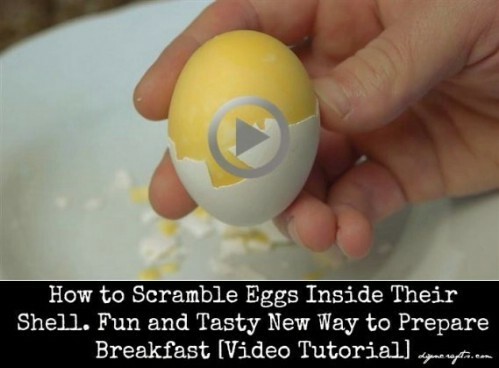 Crack the shell enough so that you can insert a spoon under it, then rotate the egg. The shell should come right off. Shake your eggs. Remember that cool hack we taught you earlier for shelling a bunch of garlic cloves simultaneously? You can do it with eggs too, as demonstrated on a Japanese variety show. Just put them all in a plastic container with some water, cover it, and shake it vigorously. The eggshells should fall off. Blow off the eggshells. This method demonstrated by Tim Ferriss is pretty amazing! Simply crack the top and bottom ends of an egg shell so that there is a hole on each end, and then blow through one of the holes. Be ready to catch the egg as the pressure forces it through the other end! Flip your knife over to butter bread with ease. This one is really earth-shaking if you haven’t figured it out! How many times have you found yourself trying to butter a piece of bread with a serrated knife that wasn’t actually designed for use as a butter knife? Its really hard to spread butter with these knives because they are just too sharp, and they tend to cut the bread instead of spreading the butter. What do you have to do to turn any knife into a butter knife? Just flip the blade over in your hand! That way when you butter, the dull side of the knife presses against the bread instead of the sharp serrated edge. Now you don’t need to go hunting around in your drawer for the butter knife! You can use the first knife you find in your hand. Another way to soften butter. We already talked about heating up a cup and placing it over hard butter to soften it. Heres another cool trick that works just as well. Have three toothpicks handy? 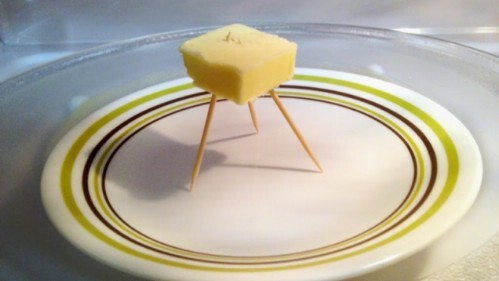 Spear your hard piece of butter to create a tripod that the butter can stand on (a tripod is a stable structure, which is why you are using three toothpicks). Put the tripod in your microwave with the butter on it on a plate. Turn on the microwave and watch the butter. When it gets sufficiently soft, the tripod will collapse before the butter starts to melt. Pull it out of the microwave, cause its done! Getting ready to bake? Using old baking soda or baking powder that is no longer effective is a good way to ruin your recipe and waste a lot of time and ingredients. You don’t have to guess though! You can easily test the effectiveness of your baking powder or soda before you start cooking. 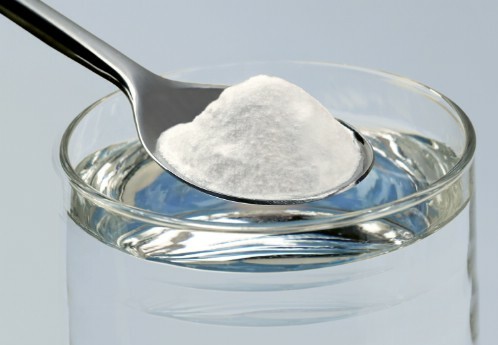 To test baking powder, just mix a teaspoon into half a cup of hot water. Does it bubble? Awesome, your baking powder is good to use! If not, replace it before you get started. And what about baking soda? Mix a quarter of a teaspoon into 2 teaspoons of vinegar. Once again, you should immediately see bubbling. If you don’t, the baking soda is no longer effective. Baking soda is rarely labeled with an expiration date, so this is super helpful to know! Keep large hamburger patties from getting too thick. Love a large burger? Ever wonder why the half-pounder you get at your favorite restaurant is nice and thin, but whenever you try making yours at home, it comes out super thick? Thick hamburgers are a pain for a couple of reasons. Firstly, they take forever to cook. Secondly, they are harder to eat. Turns out there is a simple one-step fix to both problems. Just poke a small hole through the center of your hamburger patties before you cook them. The burgers will cook faster, and you can also be assured they will cook clean through. The hole closes up during the cooking process and you cant even see it at the end. Your burgers don’t get too thick, and they’re easier to eat. Try a hard-boiled scrambled egg. Looking for a new way to try an egg? Maybe you’re one of those people who don’t like eating the yolks on their own, but you can eat them if they’re fully integrated (like with a scrambled egg), and you wish you had a way to enjoy a hard-boiled egg. There is a way to do it. Get a long-sleeved shirt. Insert a raw egg in its shell into one of the sleeves. Tie off the shirt sleeve at both ends directly on either side of the egg, holding it in place. Now, wind the shirt sleeve around, rotating the egg rapidly. This will thoroughly mix the egg yolk with the whites so that both are seamlessly integrated. Remove the egg from the sleeve after you have done this about a dozen times, and hard boil it. 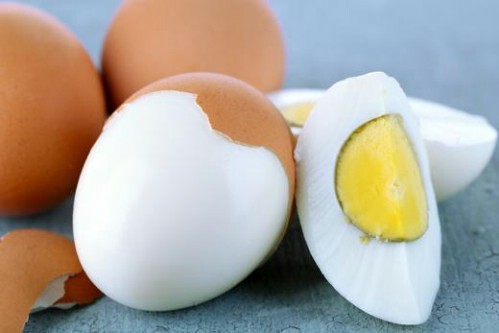 The result will be a hard-boiled egg with the yolk completely integrated into the white. Freeze leftover vegetable juice and broth. One thing that professional restaurant workers learn quickly on the job is the importance of not wasting food. How many times do you dice up tomatoes and pour the excess juice down the drain? 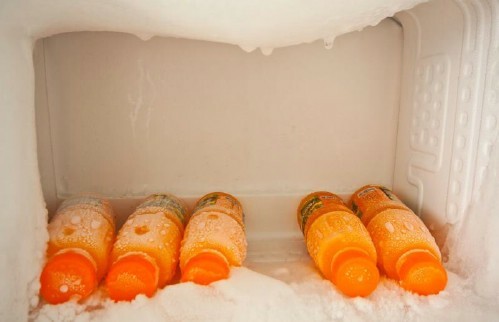 Heres a handy trick freeze it instead. Get an ice cube tray and pour in excess juice from fruits and vegetables. You can also freeze leftover broth this way instead of letting it go to waste. When you need some extra fruit or vegetable juice or broth for a soup or stew, you will have it handy! Never forget that there is almost nothing that you cant freeze. Have leftover vegetable bits? Even parts like onion stem ends and carrot tops are useful. They are great for flavoring soups. Shop at restaurant supply stores. If you are cooking at home you may think that restaurants supply stores are just for professional chefs, but there is nothing stopping you from buying their wares. 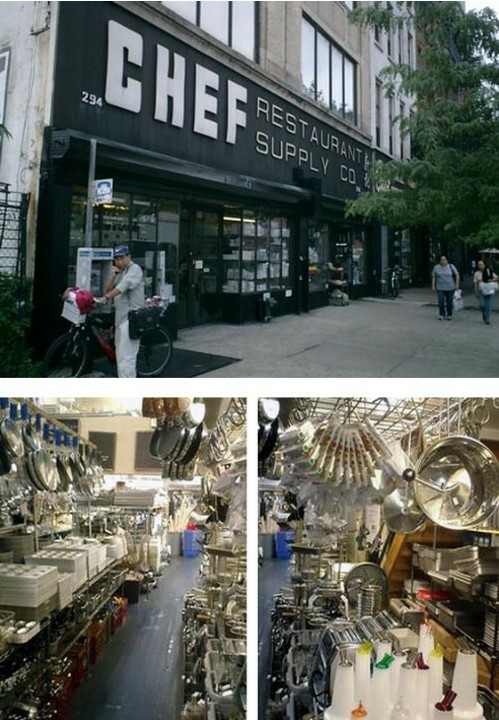 They don’t just sell highly specialized cooking supplies they sell lots of ordinary things too like pots, pans, tongs, utensils, and more. You will be surprised how much money you can save shopping from these stores, and you will get much higher quality stuff for your kitchen! Want to know how to make the coolest-ever birthday breakfast for your kids? Effortless pancake art. You know those dispenser tubes for cake icing? Keep one of those and clean it out. A dispensing bottle for ketchup or something else would work too. You just want something that lets you control the release of the pancake batter. Fill it up with the batter and drizzle it onto the pan in the shape you are going for. Its as easy as icing a cake. The result? Instant pancake art that looks totally professional! Didn’t use all your pancake mix? Safe the leftovers in the bottle; just put it in the fridge, and use it tomorrow. What a great way to save time and enjoy a delicious, creative breakfast twice. Cheese bread is awesome, but don’t you hate how the cheese is usually just drizzled on top, and when you get past that part, theres no cheese, just bread? If so, you’ll love this super simple recipe that takes minutes to complete and evenly distributes that gooey cheesy goodness! 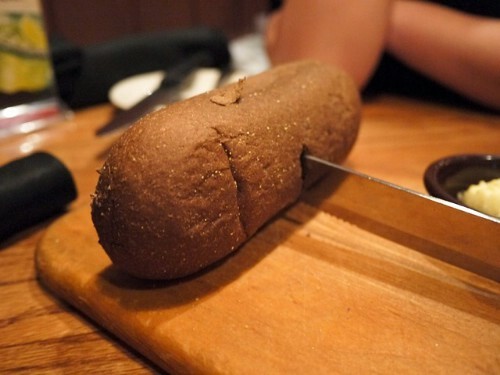 Get a loaf of bread and a knife. Make a series of long parallel cuts that go almost clean through, but not quite. You want your bread to stay in a loaf. Next, make a lot of perpendicular cuts to those so you have a cross-hatch pattern. Again, cut deep, but not to the bottom. 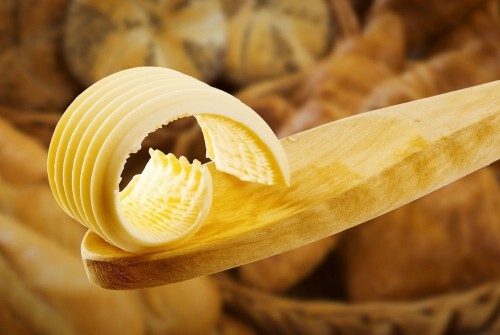 Now you can grab some slices of cheese and stuff them through the cuts, filling up the crosshatch. Bake or microwave, and the cheese will melt. Top it off with whatever you want, and enjoy! How to tell if an avocado is too ripe. While you are shopping for avocados, how do you know whether an avocado is too ripe or just right? If you sneakily pop off the stem, you can look at the color underneath. 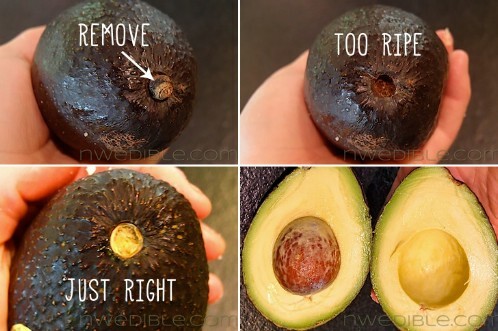 An avocado that is too ripe will be brown under the stem, and will be useless to just about everyone. An avocado that is just right will be green underneath the stem. Be sure you are looking at relatively dark avocados to begin with (the lighter green ones are under-ripe). This can help prevent you from wasting money at the grocery store. Don’t like the taste of pure water? No need to feel ashameda lot of people don’t. You shouldn’t let that stop you from staying hydrated, though, especially during the hot summer months. That doesn’t mean you have to go out and buy flavored water drinks from the store that are loaded with sugar and weird additives you’ve never heard of! There is a healthier, more delicious way to enjoy water! You can make flavored water really easily! Just get your favorite fresh fruit and put it in a jar with ice and water. The fruit flavor will diffuse into the water. You can also stir in herbs for extra flavor. Its like fruit juice, but less expensive, with all the hydrating goodness of water and less sugar. You can eat the fruit when you’re done too. 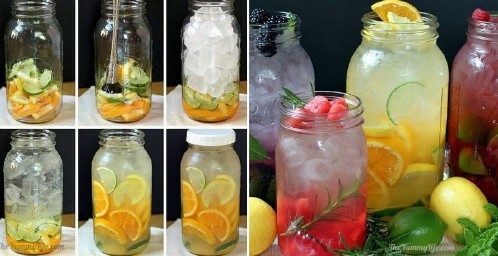 Have fun coming up with recipes for flavored water its like mixing sangria (minus the alcohol of course). There are endless flavor possibilities. 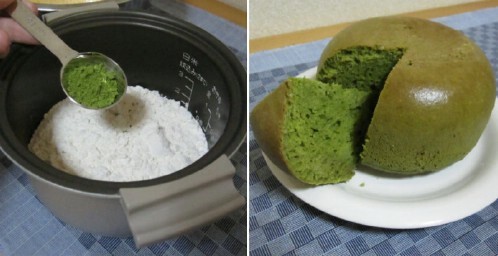 Cook a pancake in a rice cooker. 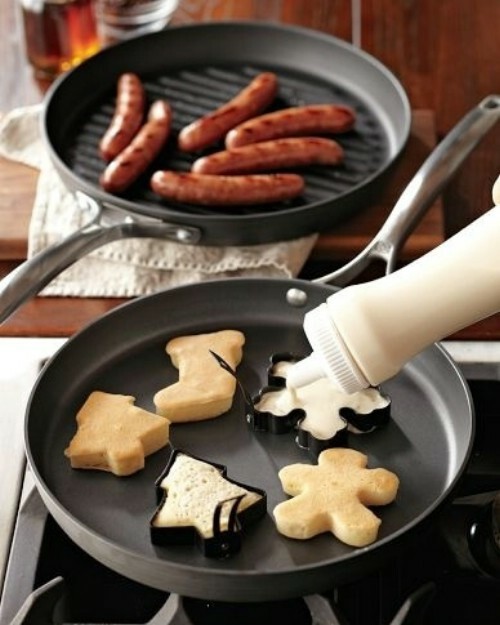 Love pancakes but hate standing over the stove minding them? Pancakes are delicious, but they are time consuming to prepare the traditional way. If you have a rice cooker though, you can skip all that fussing over the stove. Yepa rice cooker is a multipurpose device. You can pour pancake batter inside and watch in amazement as one giant pancake rises inside. Check if eggs are fresh or rotten. There are times you dont feel like you can rely on the use by date for eggs. 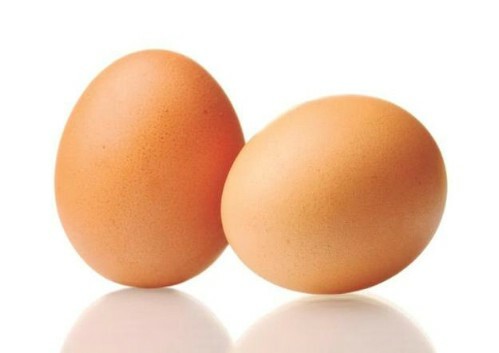 If you are in doubt, one easy way to check whether an egg is fresh or not is to put it in a large bowl of water. If it sinks and rests on its side at the bottom of the bowl, you can rest assured the egg is fresh and safe to eat. If it is on the bottom but upright, it is on its last legs. Eat it ASAP, and consider hard boiling it just to be on the safe side. If it floats, get rid of it, its done.